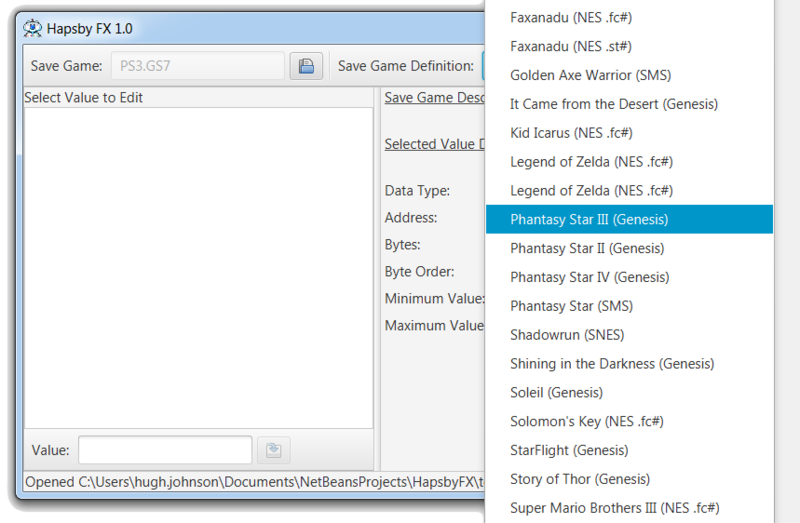 I wrote the first version of Hapsby back in spring/summer 2000 as a way to learn Java and cheat at NES/SMS/Genesis RPGs. Yeah, I cheated at a few games. I enjoy console RPGs but don't have time for all the XP/gold grinding. Hapsby was designed to solve this problem. Anyway, after a few iterations I had it working nicely and left it untouched for years. In late 2008 I had the urge to update it. Once I looked at the code I originally duct-taped together I opted for a sizable overhaul. The result was a more usable, and lighter, Hapsby 2.0. A few more years passed and I ported it to JavaFX for Java 8+. All the source code to Hapsby is available on GitHub. Once you fire-up Hapsby you'll be greeted with this spiffy window. Click on the open icon to open a save game. 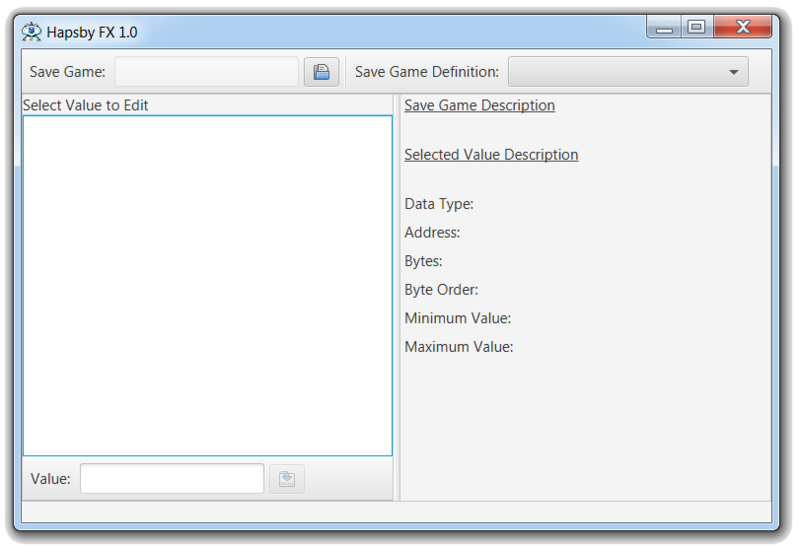 Then select the save game definition to use for editing the save game. Warning: mismatching a definition and save game is a great way to corrupt the save game. Now you can select a property to edit. 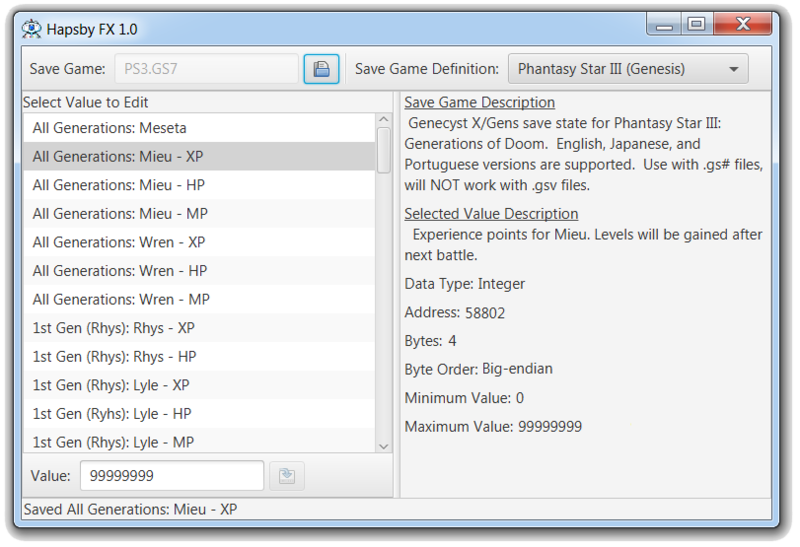 If the current value in the save game seems wacky it's a sign you're using the wrong save game definition. After you edit a value click on the save icon to save the value.